Enterprise users can from now on, manage product packages and provide package prices for their customers. A package is a set of products - with its own price - that can be ordered the same way a single product can be. There are two types of packages : single-image and multi-image packages. With the single-image packages the customers simply select the desired photos and the whole package is added to the cart. With the multi-image packages the customers are presented with a drag and drop interface where desired photos are assigned to package slots. First step of the package creation : you can see the package creation page in the screenshot below. 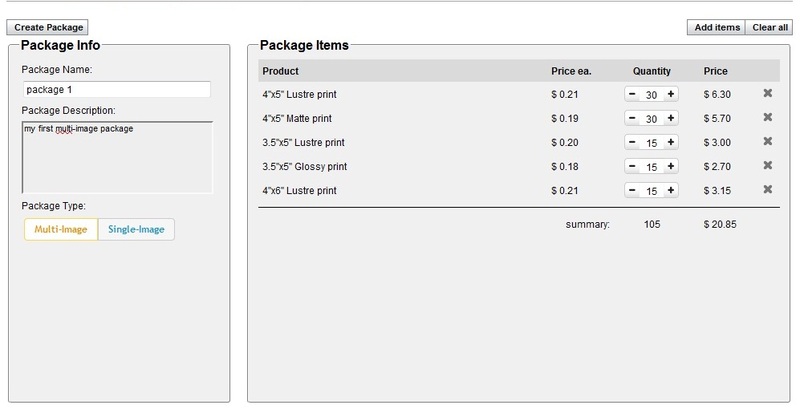 Note, that you do not set a price at the package creation stage - as for each product, you set a price in the price list in which you wish the package to be included. Second step : as you can see in the screenshot below, a package can be enabled or disabled in your price lists just as individual products can and the price can be likewise set to match your needs. The packages can be used for marketing purposes, for example to provide free products along with a product, provide package prices, or to simplify common orders. Your customers can see your package in the new product category "Packages". Single-image packages can be added to the shopping cart by simply selecting a quantity. Multi image packages are added to the shopping cart using a package filler, which you can see in the screenshot below.